Stephen Howe and his daughter Clare have undertaken a considerable amount of research into his ancestors, the Greenough, Keep and Butler families from Upton and the surrounding area. The Greenoughs appear to have been an Upton family. Stephen traced the Keep ancestors back to Edward Keep who is thought to have been born in East Hagbourne, where it seems most of the early Keeps originated. The earliest mention of a Keep that he could find is Edward Keep, born in 1781, who married Anne, surname unknown, while that of a Greenough seems to be a John Greenough born in 1764. In 1810 Edward and Anne had a son George who in 1836 married a local girl named Kezia Broad. In 1846 they in turn had a son Thomas, who married a girl from Blewbury, Rosetta Corderoy, in 1866. Sadly Rosetta died when she was in her late twenties, possibly in childbirth – she had just given birth to their third son, Alfred, born on 13 August 1872 – and her husband Thomas was left with three young sons to raise by himself. Thomas was Stephen’s great great grandfather. Following Rosetta’s death, Thomas decided that the eldest, John George Keep, should live with his uncle George Corderoy and his wife Susan in Shoreham, where they had a provisions shop. At the age of 4 or 5, it must have been very hard for John to lose his mother and then be sent to live far away from his father. The middle son, William George Keep, was 3 years old and was sent up the road to East Hagbourne to live with his widowed grandmother Kezia, then in her 60’s, and his father’s brother Frederick Keep. Thomas, who lived in Shoe Lane at this time, ran the local shop called Fieldside. He found someone to look after the baby, Alfred, while he ran the shop – possibly this was the woman whom he married a couple of years later in 1875, named Eliza Louisa Page from South Hackney, London. In 1878 they had ther only child together, Tom Ernest Keep. In January 1907 Tom married Margaret Godfrey, the daughter of Elizabeth and Thyot who was a local carpenter. In 1895 (1898? ), Thomas and Eliza purchased Ivy Farm and took up farming with the help of his son William. In 1900, William married a local girl from Upton, Maud Mary Greenough, born 1 April 1877. Apparently she celebrated her birthday on 26 December, perhaps not wishing people to know that she was born on April Fools’ Day. In January 1914 Eliza died at the age of 75 years, and eight months later Thomas himself died at the age of 71 years. Strangely, 10 days after Thomas’ death, his son William also died at the age of 44 years – conceivably killed fighting in the Great War although at the age of 44 perhaps he would have been too old to go to war. William and Maud had 5 children together before William’s death in 1914. 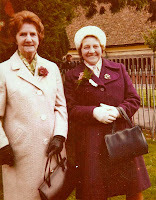 The photograph shows two of their daughters, Maud Mary (Wills) and Miranda (Wilcox). A third daughter, Olive, married Frederick Hancox. Maud Mary Greenough was the daughter of Elijah Greenough and Martha Myra Winter, in turn the daughter of Sarah Endle (or Endell) b.1808 and Jonathan Winter b.1802. The photograph shows Maud Mary with her second husband Albert Edward Butler, whom she married in 1916. Later that year Maud gave birth to a son, Albert, named after his father. Albert junior, their only child, married Elsie Eleanor Perkins in 1938. Maud Mary died at the age of 81 in 1958, and Albert Edward Butler died on his 93rd birthday, 26 June 1980. Larger versions of the photographs can be found in the photo gallery.